Microwave Switches and Matrixes for the Defense and Aerospace Industries. Quick Background : Dow-Key, a California Company and division of Dover Corporation, is the leading company in their field. They have been around for over 50 years, but in recent years they have been receiving increasing competition both locally and abroad. Targeting very specific Customers that purchase these products for their corporations. 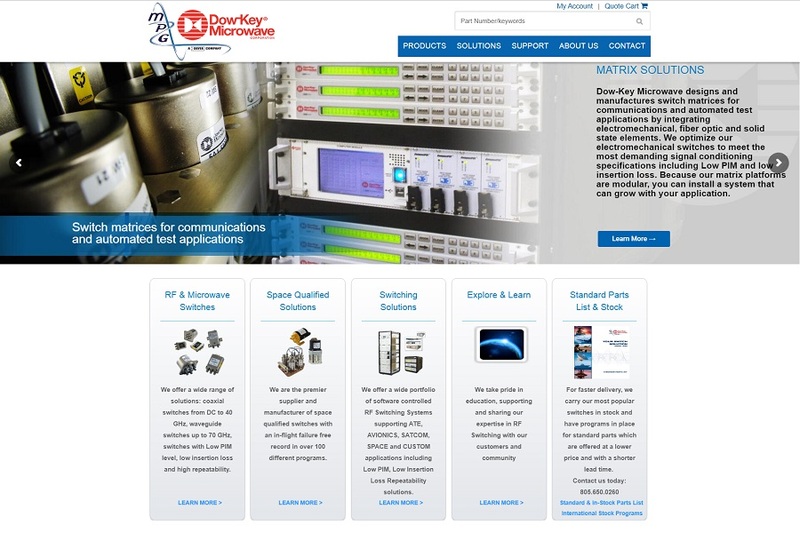 The original website was very old and poorly designed which simply didn’t represent the quality of Dow-Key’s Products. Their brand, as many do, took a hit because of the unprofessional and dated design of their website. Search engine placement for such a highly specific product line was woefully low. The most egregious issue centered on the functionality around their e-commerce which was tiresome and hard for Customers to interface with and actually complete a sale. The layout even made it difficult to contact a sales representative. The ultimate goal was to increase recurring corporate revenue through e-commerce sales and sales leads. We also planned to improve the Client’s online branding, website, search engine placement and online Customer experience. Incorporating the new Dover Corporate generated logos and color scheme. Creating a style guide for website/brand cohesiveness. Applied Best Practices Search Engine Optimization. Applied the GOiMarketing Tool-Kit for increased exposure. Adoption of Google priorities such as Video Marketing and Canon Tags. Incorporated online Press Releases into the SEO plan. Create Videos and Optimize them for search engine placement. Distribute Videos to over sixty online Video outlets. Drive Video traffic back to the website. Modern, Up-to-Date Design that promotes Client as a leader in their field. Simplified ‘Find a Product’ functionality. Ease of Check-out functionality. Within two months, Dow-Key received leads that generated over $1 Million in additional revenue to the corporation from our Internet Marketing Programs. 90% of all main Keywords and search terms ranked on the first pages of Google, Yahoo, Bing and YouTube. Literally hundreds of keywords have first page ranking. Completely updated and modern look to the website. Higher success rate for online purchasing. Worldwide visits from optimized multi-lingual international pages. Formerly low level of Search Engine generated traffic now exceeds direct traffic (60% of all traffic comes from search engines, Google organic alone exceeds direct traffic), an amazing turnaround for the company online.